Orthodontic treatments focus on correcting the position of your teeth and the alignment of your jaws. The treatment moves your teeth into their proper positions to improve your bite, and helps correct any irregularities that are in your jaws as a result. A better smile after orthodontic treatment is an added bonus. An incorrect bite should be treated as soon as possible because it can cause long-term oral health risks which may includes head and jaw pain. Straightening your teeth can help prevent the development of tooth decay and periodontal disease, as straighter teeth are easier to clean. Invisalign is a modern approach to straightening teeth. It is an alternative to metal braces. Invisalign helps patients correct a broad range of orthodontic problems and the treatment has been proven to be safe and highly effective. This type of traditional brace uses stainless steel brackets, which gives the patient a “train track” look. Today, these visible brackets are made much smaller, making them less noticeable than the metal braces in the past. 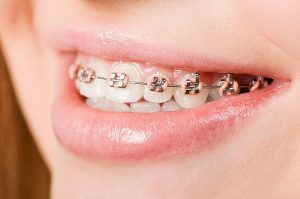 Metal braces are now more comfortable to wear than before. If you want an orthodontic brace that will closely match the colour of your teeth, you can consider porcelain braces. They consist of tooth-coloured brackets and blend in with the natural shade of your teeth. Most adults prefer porcelain braces because of the colour and the way it makes them less self-conscious during the treatment. At Cardiff Dental, you are just one step away from the smile you have always wanted – straight teeth, healthier, and giving you confidence. We will provide you with a fully detailed plan off your treatment options, costs and durations. Contact us on (02) 4954 6888 today!